The Holidays are a wonderful time, however they are also stressful. Holiday parties, gift wrapping and giving, cleaning, decorating, baking, merry-making, all of this is wrapped up into just a few weeks. This tends to leave people strung out, exhausted, and ready for a break. So I'd like to offer up one of my favorite ways to relax and detox from the stress of this crazy season. Nature. Spending time in Nature has a great number of health benefits that come with it. Growing up on the coast of Florida, I've always heard about a group of crazy people who like to go swimming, in the ocean, during the winter. Brr! But science may have determined that there is actually something good that comes from their chilly dips. According to a series of recent studies, short term immersion in cold water actually stimulates the immune system as well as triggers your body to release more endorphins, helping to boost your health and mood. Now you don't have to take the plunge to boost your mood in the colder months. With winter comes shorter days, reducing your exposure to the sun. This plays a pretty huge part in the “winter blues” and can be countered with more time outdoors while the sun is up. Also, any mild exercise can help to release those same endorphins that are triggered by the chilly dip, and even more of them are released when you're exercising in the cold. Most of us are aware that stress has a negative impact on our health and immunity. Especially for those of us who live in more urban areas, stresssors are becoming more easy to encounter and that much harder to avoid. Spending time out in nature helps us to reduce our stressors and relax. Not only does this reduction of stress improve our immunity, but when you're out in nature you tend to be surrounded by plants, which has it's own set of immune boosting benefits. Trees and other plants have to fight off disease just like we do. They each have developed unique ways to do this. One way can really benefit us as well. Phytoncides are chemicals that plants have developed to kill off harmful bacteria and fungi. Many of these phytoncides are released into the air by a breeze, some are released when you brush up against a plant, and of course there are some that are taken in when the plant is ingested. But just simply breathing in the outside air, in natural areas, can help to build your immune system and help you fight off disease. Your body works a little bit harder when you're cold, but you don't have to be shivering for this to happen. Your body is less efficient in colder temperatures. This boosts your metabolism, helping you to burn more calories. This is helped greatly when you're exposed to the cold on a regular, consistent, basis and even more so if you're exposure includes cardiac pumping activities such as skiing, ice skating, or even just a brisk walk. Most of us have an association with winter and illness. Growing up, I always heard my mother say things such as “don't go outside or you'll catch a cold!” However we really have more to fear from staying inside during the winter, at least as far as getting ill is concerned. We spend so much time indoors during the colder months, and with central air and heat all the pathogens just get circulated around our homes and businesses. The better to spread between people and cause more and more infections. 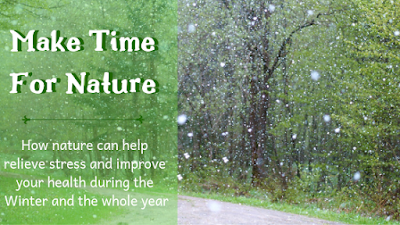 Getting outside during the winter helps keep you from that constant pathogenic exposure, at least for a little while. When you're walking through the wonders of nature, most of the time you are happy just to “be.” Nature, fresh air, trees, and plants can all help to calm your mind, helping you to find your center. This helps to reduce stress, but it also helps to reduce negative thoughts and obsessive thinking. We all do it. We get stuck on analyzing our actions, our work lives, what we could do better next time, etc. Most of us are very familiar with thoughts that go in circles just obsessing over how we messed up and how to do better if we're ever presented with the opportunity to do so. Thoughts like this lead to depression, anxiety, and a whole host of other mood and mental conditions. Science has told us, for quite a while now, that these obsessive thoughts and their associated mental illnesses are more common in cities. However, recently science has also taken these studies a bit further, confirming that just a walk in the neighborhood does not change these thought processes. One study in particular found that taking a 90 minute walk in an urban area did not effect most people's negative and obsessive thoughts, however a 90 minute walk in more natural areas, like a park or the woods, did decrease these negative thoughts. The benefits are definitely great reasons to spend time outside during the winter, but don't forget that the cold can be dangerous as well. Living in Florida, where people live in perpetual fear of temperatures under 50 degrees, I often forget certain safety measures about the cold. So here are a few reminders for those who will be exposed to the chillier side of winter. Layers are always a good choice in the winter. That way, while you're in warmer areas, you can peel off any layers when you get hot, but you also have those layers for when you're in the cold again. But don't forget your hat, scarf, and gloves when you expect to be in the cold. A lot of body heat is trapped by a hat, keeping you warmer over all. A scarf helps you protect your face, especially when the wind is blowing. Your fingers tend to get cold easily in warmer months, so in the colder ones we need to not forget to take measures to make sure they stay warm, and mittens are actually warmer than gloves for those of you who may be around the snow this winter. Water helps us to cool down in the summer, but it also cools us during the winter. Make sure that your outer layer of clothing is waterproof to help keep in your body heat and keep out the damp. Also, perspiration speeds the loss of body heat, so removing excess layers when you feel warm is a good thing to do. Your body work less efficiently in the cold, which means it's harder for your heart to pump blood, for your lungs to take in air, your digestive system to digest, etc. So for those of you who may have a heart condition, this means that you should take things slow in the cold. Physical exertion will demand more effort from your bodily functions, which means that it will be that much easier for you to over exert yourself. Don't over do it! Take it slow and listen to your body. Just like the summer, winter has it's own perils. If you're planing on spending any time outside, especially if you're doing this alone, make sure that your friends and family know where you are and approximately how long you plan on staying out. Be prepared for changing conditions. All seasons have different weather patterns in them, in winter you need to be prepared for cold weather conditions. Make sure you carry matches and other materials to start a fire with if needed, extra clothing or a blanket in case the temperature drops suddenly, etc. Especially if you're heading out in conditions you're not familiar with, check out and research safety tips before you go. I hope I have helped to motivate you to get out in nature, even if it's cold. Spending even a few minutes a week in nature can have amazing benefits. Have fun with your outdoor adventures and if you have any questions or comments please leave them below.